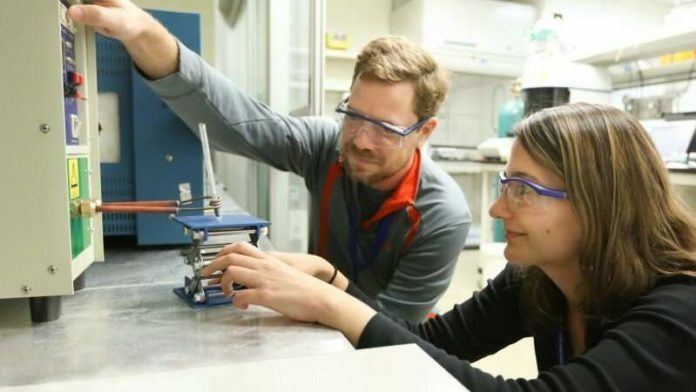 (Courtesy Oak Ridge National Laboratory/Genevieve Martin) LSU researchers used RF fields to heat iron oxide nanoparticles attached to petroleum molecules to achieve more energy efficient catalytic reactions. Researchers at LSU are working on a new process aimed at achieving greater energy efficiency in the U.S. chemical industry. University scientists are using neutrons at Oak Ridge National Laboratory to study the effects of employing an alternating electromagnetic field to produce low-temperature catalytic reactions by heating iron oxide nanoparticles with hydrocarbon molecules attached to the nanoparticle surface. According to the U.S. Department of Energy, the researchers used a radio frequency generator to stimulate the nanoparticles, transferring the generated heat to the individual hydrocarbon molecules and restructuring their chemical bonds to produce value-added products. Worldwide, the chemical industry uses catalysts—substances that facilitate chemical reactions—in about 90% of all chemical manufacturing processes as a means of optimizing energy use and reducing greenhouse gas emissions. The sheer scope of the catalysis sector suggests that any reductions in energy consumption for certain chemical processes could have substantial economic and environmental impacts. The team exposed its samples to an RF field in a laboratory chamber, immersed them afterward in liquid nitrogen to freeze everything in place, and then observed the results using neutron-based vibrational spectroscopy at the VISION beamline located at ORNL’s Spallation Neutron Source. Neutron scattering combined with vibrational spectroscopy is an ideal method to study energy transfer across inorganic-organic interfaces. LSU researchers are currently developing advanced methods of synthesizing iron oxide nanoparticles and modifying their shape to control a sample’s surface sites involved in adsorption and surface reactions. Various particle morphologies—including spheres, cubes, and hexagons—can be produced to optimize their use in different catalytic applications. Read more about the U.S. Department of Energy experiment.